Big card, Big Pieces stamp set. Card size is 7-1/8" x 5-1/8". SU's new Big Pieces is BIG. Love it. 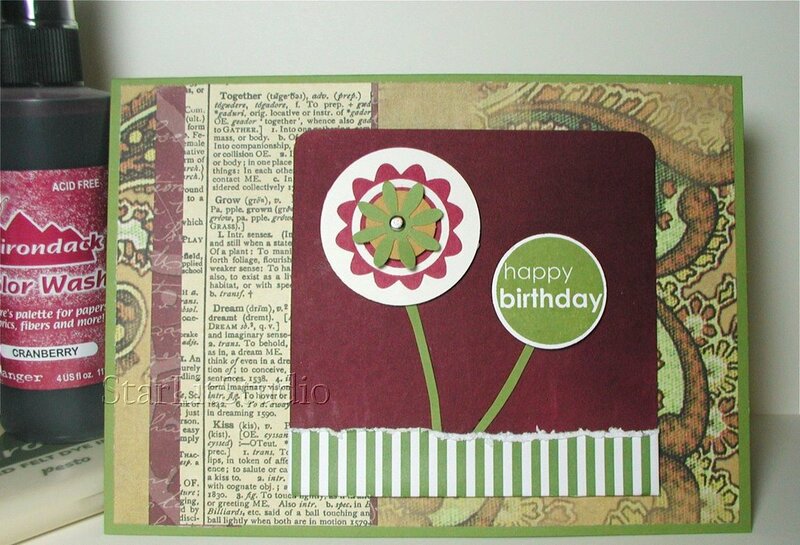 Circle sentiment stamp is from Inkadinkado; papers are 7gyspies and Scenic Route. Daisy punch is an old SU one since retired. Gives dimension but without the time-consuming cutting. SU's card pg. 11 of the winter 06 mini was the springboard for this card. A lightweight coaster was spritzed with Cranberry Adirondack Color Wash - it leaves a nice, soft, velvety finish. 7gypsies, Scenic Route papers. 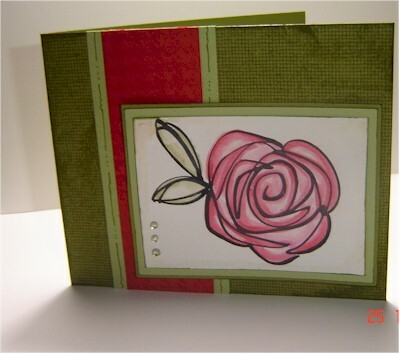 Inkadinkado HB stamp, Adirondack ink pad in Cranberry & Pesto used. Fun, quick & BIG. I'm really taken with the combination of visual textures. This is so nice! I'm a SU demonstrator and tried for some time to be a purist in my work. I'm finally enjoying broadening my perspectives again. Thanks for the inspiration. This is a nice combination of patterns. I like it alot. zoinks!!!! This is so hot!